Look at that word on its own and tell us it doesn’t look like something you’d find in a foreign language dictionary. It does, right? Well, we’re here to translate it for you, and break it down, so you, too, can think and speak about escrow with ease. Let’s start with the mortgage billing statement you receive each month. You might be wondering why sometimes the amount to pay on it is more than just the principal and interest you agreed to borrow when you bought your new home. No doubt it has to do with that word we just brought up: escrow (account). Simply put, an escrow account is like a separate side account that’s there to cover your property taxes and/or your homeowners insurance. Think of it like a safe money stash that your lender holds for you. Here’s how it works. When people get a mortgage to buy, build or refi a home, most lenders like to set up two accounts. One account that has to do with principal and interest, and one account that has to do with property taxes and/or homeowners insurance. The latter is called the escrow account. With that account, the lender can pay your property taxes and homeowners insurance on your behalf. What the heck is the advantage? The biggest advantage to having an escrow account is that it rolls big payments, like property taxes and homeowners insurance, into one easily manageable monthly payment included in your monthly mortgage billing statement. What’s more, your lender handles the payment on your behalf directly with your local tax authority and home insurer. It’s one less thing you have to worry about. You will still get a “This is Not a Bill” statement from both parties so you can monitor fluctuations and prepare for any adjustments in your payment. On a side note: Some states require your homeowners insurance bill be sent you, but it will still be paid on your behalf. Why the heck do I have to have it? If you borrow more than 80% of your homes’ value (in other words, you may not have put 20% down on your home loan). If you live in a flood plain and you are required to have flood insurance. Why the heck did my property taxes and homeowners insurance change? So if you look at your bill, you’re going to see the amount the lender is paying for you for those escrow items. If nothing ever changed in the world as long as you owned your house, these figures would always stay the same. News flash: the world does change. And those changes can affect your property taxes, and your homeowners insurance. They can go up, or they can go down. Let’s look at a couple of examples of what can make property taxes or homeowners insurance change; thus, affecting what the lender is paying out of your escrow account. Let’s say the city, town or township you live in just voted to pass a public safety tax. They’re putting more cops on the street to keep you safe, which is good. However, this may increase what you owe on your property taxes. Which in turn, means your monthly escrow payment may go up in order to cover those new taxes that your lender pays on your behalf. Or here’s another example. Congratulations, you just put a new pool in your backyard. Along with congrats, our sympathies, as your home insurance premium just went up in order to cover the pool. Again, this means your monthly escrow payment might go up to cover the new insurance premium that your lender pays on your behalf. How the heck is my monthly escrow amount determined? About once a year, your lender does an assessment on your behalf of what your property taxes and insurance bills may be. 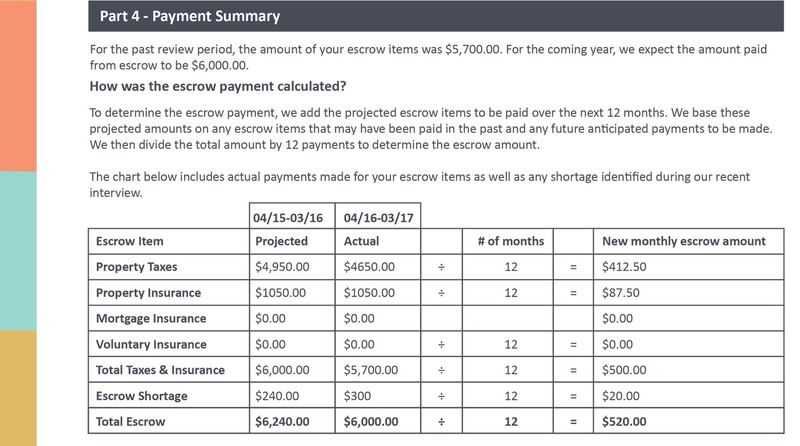 This is an estimate of what you need in your escrow account in order to cover those bills and make sure you are not paying too much or too little into escrow. So, the first year into your mortgage you’re establishing a baseline as to how much to have in your escrow account per year to cover your property taxes and homeowners insurance. Based on that, the following year you put the same amount in (most escrow accounts require a minimum amount in them equaling 2 months of escrow payments, this is subject to state law). But let’s say somewhere along the way something changes with your property taxes or home insurance. This can create a surplus or shortage in your escrow account. Let’s pretend you switched insurance companies and your insurance went down. Because of that, you didn’t have to pay as much out of your escrow account. This results in a surplus. Your lender would probably cut you a check for the unused amount in your escrow account. Woohoo! Conversely, if you had that 4-car heated garage constructed behind your house, your property taxes would probably go up and your lender wouldn’t have enough to pay it out of your escrow account. This would result in a shortage. You would have to make up the difference, most likely by spreading that amount over the next year, causing your monthly payment to go up. Whichever direction your escrow payment goes, your lender will send you a statement similar to the one below that shows how it will affect your monthly payment in the next year. How the heck did we do? Look, we know the topic of escrow is not at the top of your list of fun things you need to know. This would probably be a lot more attention-getting if the subject were chocolate. But the more you know about escrow, as well as your way around a mortgage statement, the better off you’ll be as a consumer. And hopefully, that word “escrow” won’t look as foreign anymore. For specific questions about why your property taxes may have gone up or down, reach out to your local tax authority. Specific insurance policy questions should be directed to your insurance company. And of course you can always call your lender with any questions about your mortgage.